Wan Ching Yuen Centre for the senior citizens is under the aegis of the Than Hsiang Buddhist Welfare Association. This Home was founded by Venerable Wei Wu on a charitable basis following the Buddhist spirit of "benevolence, compassion, joy, and equanimity". The primary aim of the Home is to provide personal quality care for the aged whereby they can lead a happy, meaningful and useful life. The subsequent aims are to provide facilities for the Buddhist fraternity to cultivate Buddhist teachings, as well as to enable and relieve working children the problem of caring for their aged parents while they are at work. WCY Handicraft group comprises of individuals who are interested in helping and learning. We welcome everyone regardless of race, religion and gender. We welcome anybody who have knowledge of sewing and anybody who would like to learn the craft. Our handicraft group meets on every Tuesday, at 10.00 AM to 2.00 PM. Our shop is open on every 1st and 15th day of the Chinese calendar. May your compassionate heart touch on others. We welcome all people with different talents volunteer in conducting activities such as reading newspaper for the aged, teaching simple conversation in different languages etc. 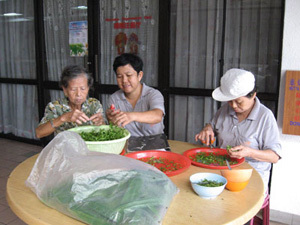 Than Hsiang Vegetarian Food Service is under the aegis of the Than Hsiang Welfare Association. It started in 1992 with a canteen catering to a small, but regular, clientele. In 1999, a Restaurant was added after some renovation work and this proved to be hugely popular. Now Than Hsiang Vegetarian Food Service is an array of vegetarian food services and includes in-house food service besides the canteen. The Than Hsiang Library is situated on the 4th floor of the new Temple Building. The daily opening hours of Than Hsiang Library starts from 9.00 am to 5.30 pm. Monday to Sunday. The library will be closed during public holidays. We also need helpers from time to time to assist us in several areas of works in the temple and the library. We appreciate all kinds of assistance and volunteer work. Mitra Line was established on 19 February 1990 to provide telephone counselling and hotline services. It assists, guides and cares for those who are emotionally lost and confused. Beside telephone counselling hotline, the Centre also organises Talks, Film-Shows, Intimate Relationship Workshops, Group-Reading, Sharing and other workshops for all to participate, learn and develope. We warmly invite you and your friends to join Than Hsiang Mitra Welfare Centre as volunteers in any of the following groups: Resource Group, Activity Preparation Group, Publication & Report Group, Recreational Group, and Social Service Group. A volunteer attaches importance to matters of love and virtue. He or she serves with love and virtue in his or her heart. Money is never part of the motivation. Since the service is nothing but pure devotion, it is priceless. Why do so many people willingly participate in volunteer organizations? Volunteer work differs from other jobs. Other jobs are always for money or for pay. Volunteers work out of joy and to form affinity.The motivation is different. Since I became a monk 60 years ago, I have worked my entire life to teach the Dharma and to benefit sentient beings,without taking a vacation or resting on a Sunday or a holiday. Being a volunteer for 60 years, I have experienced Dharma joy and happiness that no money can buy. If someone can serve others with perfect willingness, i.e., becoming a volunteer, he or she will advance substantially in his or her spiritual realization. to governmental welfare projects and programs and charitable assistance and civic education. wisdom, and virtue. These are precious properties that can never be taken away. If you do things you do not want to do, you will suffer a great deal. So service “with perfect willingness” yields intangible value. The main purpose of being a volunteer is to learn to be compassionate,to smile, to get along with people, to give pleasure to others, to plant the seeds of merits and virtue that will form good affinity with others.